Democrat Mike Frerichs (Wannabe Latex Salesman Candidate for Illinois Treasurer) breathlessly put out a press release today touting his long and decidedly mixed list of organizations that he claims are endorsing him in the election. He's also touting a list of Democrats who are backing him including Robin Kelly, Bill Foster, and Jan Schakowski. Unfortunately for candidate Mike and his staff, they can't help themselves when it comes to getting things right. As you likely recall, Mike Frerichs launched his campaign on a lie. You can view that video on Frerichs bold-faced lie here. After that, his campaign staff couldn't get the details right when they announced a fundraiser in Chicago as they 'thanked' the wrong guy for hosting the event. Back to the matter at hand: his list of endorsements. As we called it earlier, the staffer gleefully putting up this release on Mike "Tall Tales" Frerichs' Facebook page forgot that web addresses typically start with 3 "dubyas". Not 2. Although they desperately want to be taken seriously and 'eat at the big kids table', someone is clearly not ready for prime time. 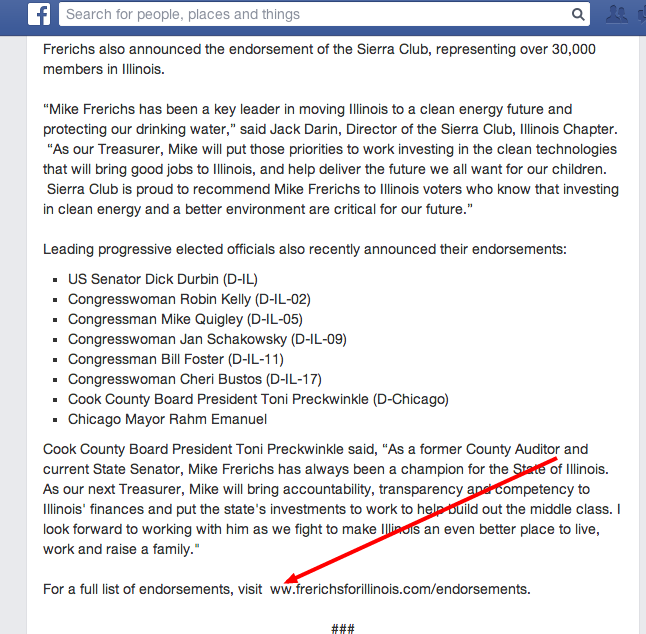 It took a mere 48 hours for the Mike Frerichs for Treasurer campaign to fix the fundraiser name error. Let's see how long it takes for them to remedy this careless situation.